This morning we had the incredible opportunity to visit the Soya-Kanpo School and speak with Dr. Qiu about her clinical practice. 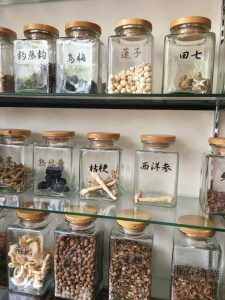 Kanpo, a traditional medicinal form adopted from China in the 7th century, takes a holistic approach towards treating illness and largely employs herbal medicines in order to do so. Dr. Qiu has been a practicing Kanpo doctor for many years and is very well known throughout Japan. We were only able to meet her thanks to the generosity of Aridome-sensei’s sister, who has interviewed Dr. Qiu many times while writing health-related pieces for magazine publication and kindly offered to introduce us. Upon arrival, Dr. Qiu welcomed us into the clinic and provided a space for us to sit down. Having only spent time in Western clinics myself, several differences were immediately apparent. The walls were lined with jars of herbs including several varieties of mushrooms, plant roots, and even seahorses. Diminishing some of the skepticism that I initially felt upon seeing these, Dr. Qiu explained that each of the ingredients used in Kanpo is rigorously tested (for heavy metals, purity, radiation, and potentially dangerous microbes) by the Japanese Government’s Ministry of Health, Labour and Welfare. She further added that Kanpo practitioners are typically trained in Western medicine as well, such that knowledge from these two approaches is not only reconciled but actually employed in a complementary fashion. By focusing on the acquisition of knowledge surrounding disease etiology at the molecular level, Western medicine can provide more specific details about the underlying causes of some illnesses. This can bolster Kanpo’s understanding of illness, which considers factors ranging from bodily constitution and age of a patient to the season and other environmental factors in which an illness emerges. I want to note one compelling example explained by Dr. Qiu in which Kanpo has been able to work more effectively than Western medicinal approaches. Although she provided several compelling examples, I was particularly interested in her description of atopic dermatitis, a condition for which the cause is unknown where dry and scaly patches appear on the skin. While Western medicine has only been able to treat atopic dermatitis with antihistamines, which prevent the itching that arises from swelling and vasodilation characteristic of an allergic reaction, Kanpo has been able to more effectively treat the underlying causes. It has thus been necessarily embraced and supported by the Dermatological Society of Japan. Given that traditional medicinal approaches such as Kanpo are often overlooked as pseudo- or non-scientific, I found it fascinating that they have been forced to embrace it as a more suitable treatment for atopic dermatitis than anything they have been able to provide so far. Overall, I was deeply moved by our visit to the clinic. Not only did it attenuate my skepticism surrounding Kanpo, but it opened my eyes to another opportunity in which science, East Asian studies, and Japanese language intersect. Having often heard skepticism myself from others at Bowdoin upon hearing that I study these subjects, it was inspiring to see a kind, skilled, and charismatic medical practitioner employing her extensive knowledge surrounding each of them for the sole purpose of improving the health of her patients. Kanpo(漢方): Before meeting Dr. Qiu, I gave a draft of my kanpo-related questions to Aridome sensei (質問は翻訳してありがとうございます!) which he ten sent forward. Dr. Qiu answered all of the listed questions with clarity, but before she did that, she offered us a small a glimpse of her life story and how she ended up as a kanpo doctor. As a child born during late maternal age, she required medical attention, a responsibility which her father as a pediatrician and later a kanji doctor. Through tangible experience, Dr. Qiu decided to follow into her father’s footstep and become a Kanpo practitioner. Kanpo places more importance and the individual and surroundings than “genetics.” In biomedicine forms it is really important to know the race and ethnicity of an individual as some of us are prone to certain diseases such illness. However, although Kanpo does take into consideration these factors-its main regard is the individual’s body constitution and response to the environment. Kanpo’s main goal of restoring balance in the body is achieved through enforcing the body’s immune system or boosting one’s chi or ki. In cases of unknown cause or a new disease, such as radiation exposure, Kanpo’s approach is the above: BOOST THE CHI. Dermatologist, Cancer-Treatment Facilities, and women who wish to conceive are embracing Kanpo. The difference in kanpo between Japan and China: in Japan, Kanpo and biomedicine are seen as complimentary to one another, while China it is regarded as its own way of medicine (separate from bio medicine) and is practiced independently from biomedicine. 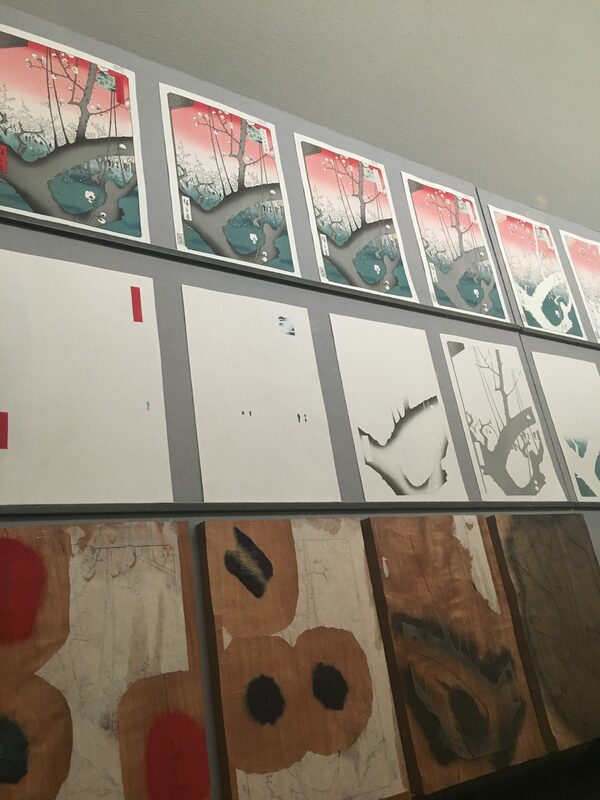 The Process of making a Woodblock print (Edo-Tokyo Museum) from right to left. 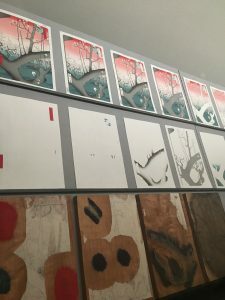 There are many wood blocks that go into making one single print. In the early summer hotness, we took the full train with サラリーマン for half an hour and met Aridome-Sensei’s sister at Ebisu Station, from which we headed to Dr. Qiu’s Kanpo clinic. The clinic first impressed me as a very cultured space, with all the glass containers with herbs and wooden tables and decorations, giving a sense of rituality. And indeed, as Kanpo is all about recovering the balance of the body, boosting 気, and seeking a harmonious relationship between the body and the environment, one could view it as a ritual of purifying, or liberating, the body. Dr. Qiu is incredibly insightful and articulate, and I really appreciate that she was trying to make Kanpo understandable and relatable instead of mystifying and elevating it. It was very enjoyable to listen to her, and in the room, I could feel an energy flowing that bonded everyone together and relating us to her sharing. Although my previous knowledge of traditional Chinese medicine helped with understanding all the concepts and ideas Dr. Qiu talked about, it was very interesting to hear about her experience practicing Kanpo in different countries. Her example of giving a 強い prescription and 優しい prescription to people of different constitutions (体質) and body build showed that Kanpo was really individual-based and that the treatment heavily relies on the Kanpo doctor to keep a long-term contact with the patient. Dr. Qiu gave examples of treating women with breast cancer but also want to be pregnant to speak to how Kanpo works, and this part was new to me. If thinking about the hormone level, as the Western medicine would do, treating breast cancer and helping a woman have a baby are contradictory since an increasing hormone level to cause breast cancer to deteriorate while to get pregnant a high level of hormone is required. She approached the issue by attacking the core problem that caused both illnesses. From the perspective of Kanpo, both breast cancer and difficulty to get pregnant are results of 瘀血, or blood stasis, which means that the blood flow in the body is thwarted. The treatment Dr. Qiu did was to boost 気 and give prescriptions to make blood flow easily. And after three years a patient successfully got pregnant at the age of 38. Her incredible explanation and stories were fascinating and relatable. The holistic view of the body and the focus on the interactions of the body and the environment require that Kanpo is not just medicine but a lifestyle since treating from a holistic view requires living thinking holistically about the body. After lunch at Ebisu, we “traveled” to Edo-Tokyo Museum, with an incredible design and exhibition of Edo-era and modern Tokyo. This is Nihonbashi (the bridge of Japan), through which people could enter Tokyo during Edo-era. 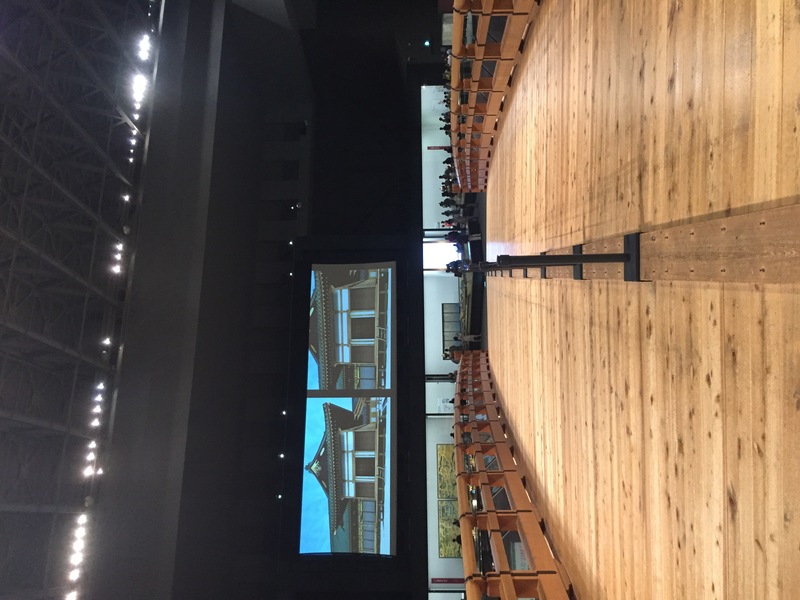 In the museum, Nihonbashi divides the exhibition into Edo-era and modern Tokyo areas and also connects the audience to the heart of Tokyo since we had to walk through the bridge to enter Edo. 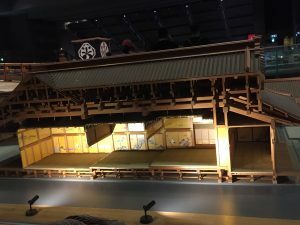 There were incredibly delicate models of Edo-era buildings, among which this Kabuki house impressed me most. The Kabuki house is a manifestation of Shogun’s power and status. 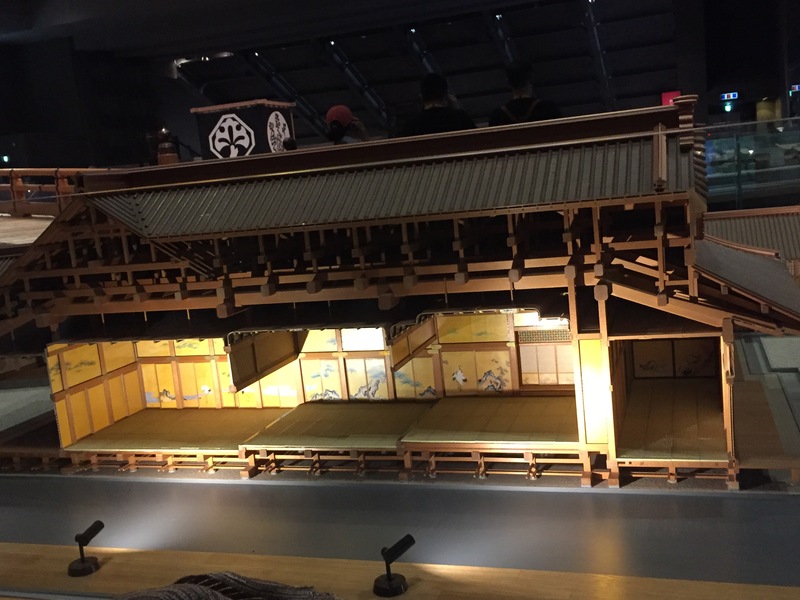 The different levels of the floor were suited for people of different political status in the shogunate, and the little door on the highest level was an emergency exit for the shogun if anything happens. The Edo-era exhibition opened up my mind about Japanese history and the part about how the shogun balanced the power of local daimyōs by having them living in Edo for one year every three years and keeping their family in Edo. This was also my first time really thinking about a museum/exhibition politically. 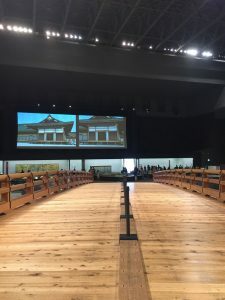 As suggested by the reading, the Edo-era exhibition idealizes the working class while completely ignoring the fact that people in the working class encounter all kinds of difficulties and the riots they started. 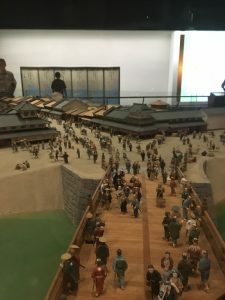 This observation was definitely true in the museum, since the image of the working class in Edo-era was shown as hardworking and living in harmony, through the vivid house models and delicate interactive facilities. However, the gender factor was absent in the Edo exhibition, while in the modern Tokyo section, the exhibits were mostly clearly gendered, the advertisement for women’s beauty products, for example. When I was talking with Prof. Selinger about the gender factor, she brought up an interesting question: why does the museum choose school girl uniform to represent the 1990s? She brought up an argument that since the economy started to go down in late 1980s, the industry targeted at young girls as consumers and commercializing school uniforms might work. I think that while school girls became the consumers, they were also consumed as a collective, considering that school uniforms could mean the main character of commercials would shift from women to teenage girls, and that school uniforms wiped out the individuality, making the girls vulnerable to the consumption of Shōjo, which emerged later. Okay so maybe that pun was a little bit of stretch. Moving on, today we met with Dr. Qiu at her kanpo (漢方) clinic in Ebisu. I’ll be blunt: it was absolutely fascinating hearing about how she became interested in kanpo, how she came to be where she is today, and the kind of practice she does. Dr. Qiu was originally from inner Mongolia, where her father was a pediatrician of Western-style medicine. Dr. Qiu, herself, apparently had something of a weak constitution (taishitsu) and Western medicine couldn’t really address or treat it. So, her father took a year’s leave from his practice to study kanpo, searching for a way to heal. When he returned, Dr. Qiu became something of his first “guinea pig,” but to remarkable success. Her father maintained his Western-style clinic, but began to expand his kanpo practice to his neighborhood; eventually, his patients seeking kanpo healing outnumbered those that went to his clinic. After the transition to kanpo, Dr. Qiu and her sister helped out in the waiting room, receiving and serving tea to patients. So Dr. Qiu’s interest in kanpo has a very personal connection and backstory to it that I think is a wonderful story. According to Dr. Qiu, and very much aligning with what we’d read previously, kanpo is all about identifying and healing the imbalances in the body and has a strong environmental component. Rather than addressing individual problems, kanpo seeks to remedy the body as a whole, and many of these individual problems can be ascribed to an overall imbalance in the body and/or ki. One thing I thought was astounding was the strong regulation on medicine that exists in Japan. Whereas in the US, a lot of treatments might be considered “dietary supplements” and thus would not be regulated under the FDA, in Japan everything is tightly regulated. So many of Dr. Qiu’s medicines are purchased through a middleman company(?) that imports the medicine from China and undergoes strict inspection to ensure that what is on the label is what the patient is getting. I’m not entirely sure how this tight regulation plays out economically, but from a health and environmental perspective it seems like an excellent system that the US lacks. I was also intrigued by how complimentary kanpo and Western medicine are perceived in Japan, whereas elsewhere (i.e. the West) they might be perceived as at odds with one another. I think it highlights the strengths of each; kanpo seems to be particular effective at treating chronic and complex illnesses, while Western medicine might be more effective in the short term at treating specific, targeted illnesses or diseases especially when the pathogen is known. Kanpo also excels at, when an exact “treatment” is difficult to pin down, boosting the body’s natural defenses and ki. What also struck me was how close and intimate Dr. Qiu seemed with her patients (from her stories). Specifically, when the 3/11 Fukushima nuclear disaster happened, Dr. Qiu was considering returning to Mongolia; apparently, the Mongolian embassy(?) was offering free tickets for citizens to evacuate and return home. Many of Dr. Qiu’s patients called her directly, expressing concern for her and explaining that they would completely understand if she decided to return home. But, they added, they would be deeply grateful, too, if she decided to stay–that’s how close and important they felt Dr. Qiu and her kanpo practice was to them and their healing. I think this is a wonderful example of putting someone else’s needs before your own. I was also struck by how lively and energetic (genki; 元気) Dr. Qiu was, and by how body language and gestures also played an important role in telling her stories. Finally, Dr. Qiu served us some おいしい kanpo medicine to dispel any impressions that kanpo tastes bad. We also got to measure out a little take-home bag of medicine too. すごい! Sugoi! Very cool! The rest of the day was devoted to the Edo-Tokyo Museum, housed in a building that looks like it could have been from Star Wars (think maybe the walkers?). The museum documented the historical transition from Edo to modern day Tokyo, but evidently presents a very idealistic, hardship-free view. 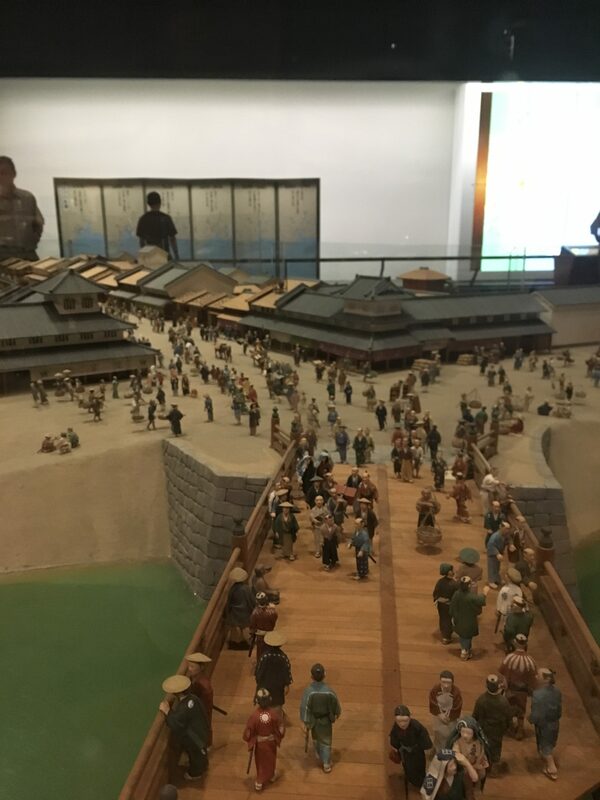 Still, it was interesting to explore the history of Edo, and a lot of the displays and dioramas were interactive (always a plus for me, when going to museums!). We also took some great, at times hilarious photos, so stay tuned! I am so terrible with titles that I have decided to skip it altogether. Today (yesterday as of time of blogging) has been AWESOME. While I do procrastinate on a regular basis, the readings really give wonderful insight and different perspectives into what we are seeing in person. Super ironically, Ethan has been absent from every single site he discussed in his presentation, but hopefully his research is going well and our photo skills are worthy enough. General: I do notice that my general pace of living/walking has increased IMMENSELY. I can not only catch up with my Bowdoin peers but also somewhat match the speed of Tokyo office workers heading to their destinations. Very proud of myself for that. Despite having only been here for 2 days, I do feel like I am not in a “new, strange” place because of the previous weeks’ preparation and my personal interest in YouTuber food vloggers. We had Japanese style Thai cuisine for lunch (also interesting is the frequent marketing of the chicken rice combo, often associated with Singapore whereas, in USA, Thai restaurants usually promote pad thai or green curry). I think it is fascinating to try foods outside of their place of origin to see how they have changed to accustom the available ingredients and the palate of the consumers. Yakiniku, despite its Japanese name, is very much associated with Korea. Food can be enjoyed by many, even those who protest against other political issues. Kanpo: Dr. Qiu was very very engaging even though my Japanese skills are abysmal. The most interesting part of the trip for me, since I have had a lot of encounters with traditional medicine, was the strict regulations of herbs by the Japanese agency for food and drugs. So meticulously guarded that the rich in China are willing to pay extra to buy their medicine from Japan despite the Chinese production. It is very different to consider kanpo as a “complement” or “alternative” to Western biomedicine, which somehow lowers the status of its legitimacy when I have grown up mainly reliant on Chinese traditional medicine. 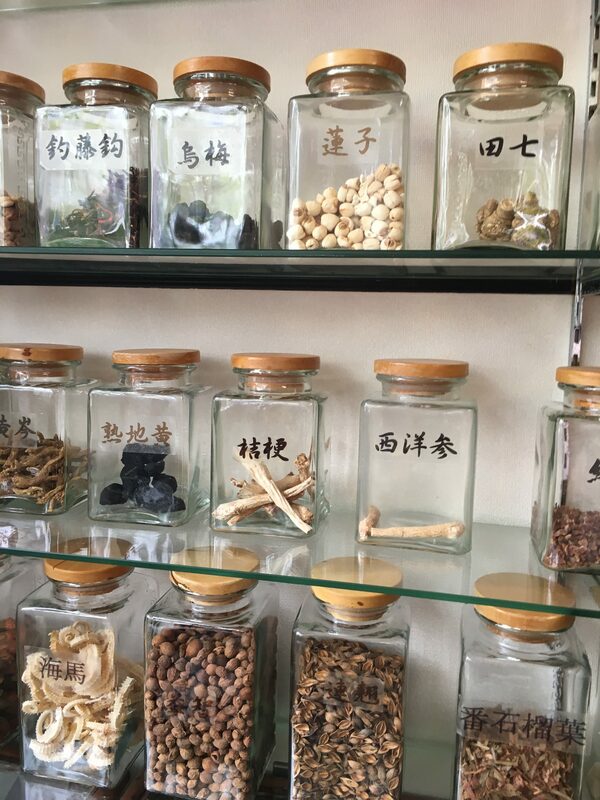 My home in Hangzhou, China is situated near not only the province’s TCM university hospital but also family-owned pharmacies that date back dynasties. It is sold as part of tourism. Especially with the increasing New Age spirituality movements, there is a preference for “nature” products from the “mystic East.” Hopefully, the interest develops as a well-rounded acknowledgment instead of as an enchanted, magical method. While sitting in Dr. Qiu’s clinic, I actually thought about reviving my interest to become a TCM doctor… but we shall see. Edo-Tokyo Museum: I love interactive museums with moving exhibits and replicas. I am glad to have freshened up on Japan’s recent history last night to be able to better appreciate the exhibits. The skilled and extravagant exhibits, built with bubble money, show signs of a specific political, nationalistic agenda, but without the governmental support and funding, this masterpiece would not exist. Because of my very limited knowledge of Japanese history, I learned a lot about the Edo-dominated narrative of the Japanese identity through the tour. But, I want to discuss a bit about finally connecting my interests. In the Edo section of the museum, there are amazing replicas of kabuki theaters and Shinto festival parades. I am very much involved in the technical side of theater as well as the ritualization of religion. It clicked. Rituals are religions’ performances, altered and renewed through time. Some are discarded while others support the religion’s existence. The misconception, IMO, is to say that theater is an imitation of life. The stage is not reality but wants to become as “real” as possible. I do not agree. I think the stage is useful to construct a particular version of “real” that engages the audience to question and to doubt their idea of the “real.” The rituals grasp with abstract ideas and present them in more accessible forms for the people. I am not very articulate with these thoughts (yet), but I will definitely be thinking about it tomorrow as we venture to the insides of Meiji-Jingu.